What Wonders Lie Beneath the Waves? The lands of the Ninth World are vast and filled with the leftover marvels of the prior world. But the ancients didn't live and work their strange ways only upon the land, and the secrets, treasures, and deadly dangers of the past also lie beyond the vast horizons, and beneath the foam-flecked waves, of the Ninth World's great ocean. Ancient ruins? Secrets? Treasure? Gods? Any of these, and rewards yet unimagined, may await discovery for those willing to leave the comforting familiarity of dry land and accept the ocean's cold, dangerous embrace. 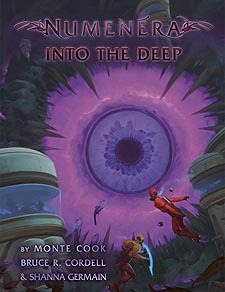 What will you find when you venture into the deep? Details of the mysterious invisible corridors that allow surface dwellers to breathe and operate at any depth - if they can find and navigate these pathways. Plus other new modes of transportation to take characters out to sea and beneath the waves. Two new playable races, the skeane and the naiadapt, for aquatic campaigns. New creatures, including the deadly viscid watcher, the enigmatic frozen omath, the titanic kaorund, and the squidlike phayclor. Exotic and fascinating environments to fill your players with wonder and take your adventures to unique and breathtaking realms.